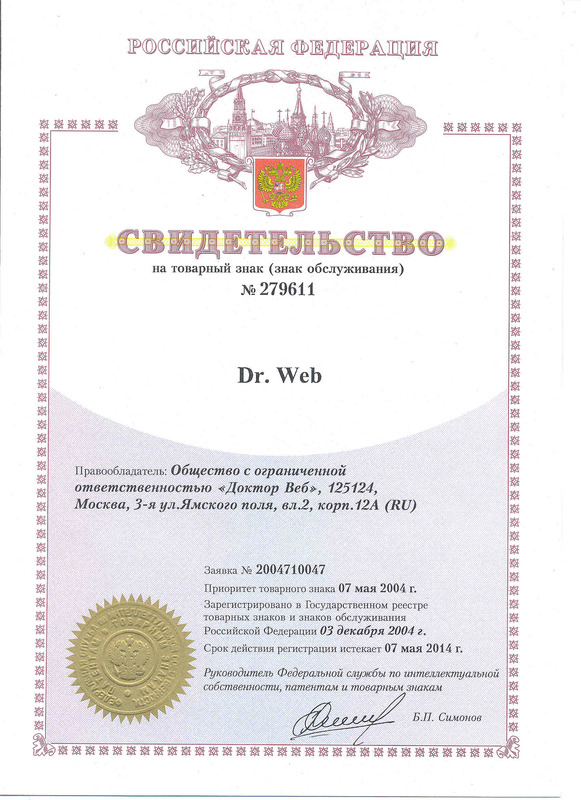 Certificates are classified as confidential so they are not published on the site; however, Doctor Web provides certified copies of them upon official request. 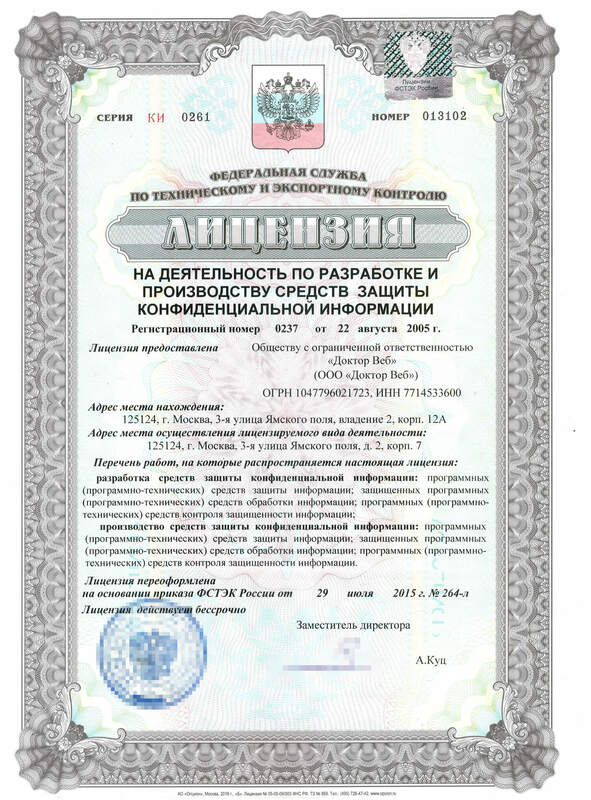 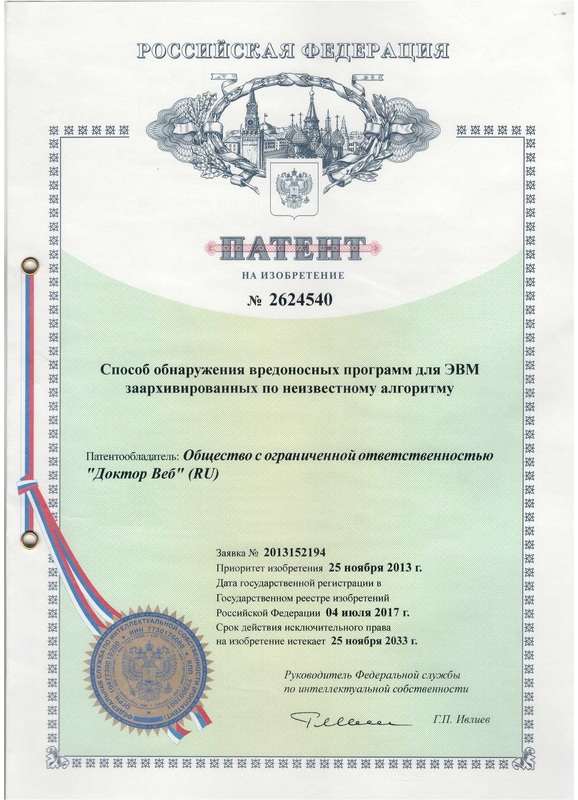 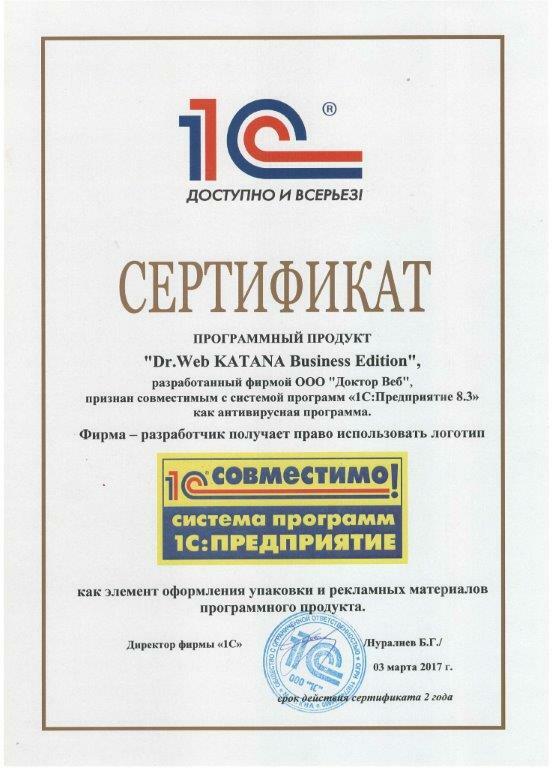 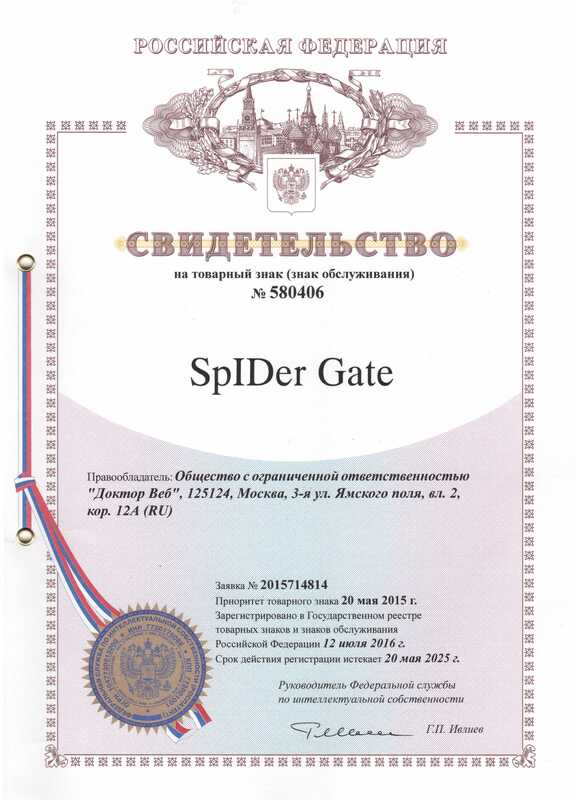 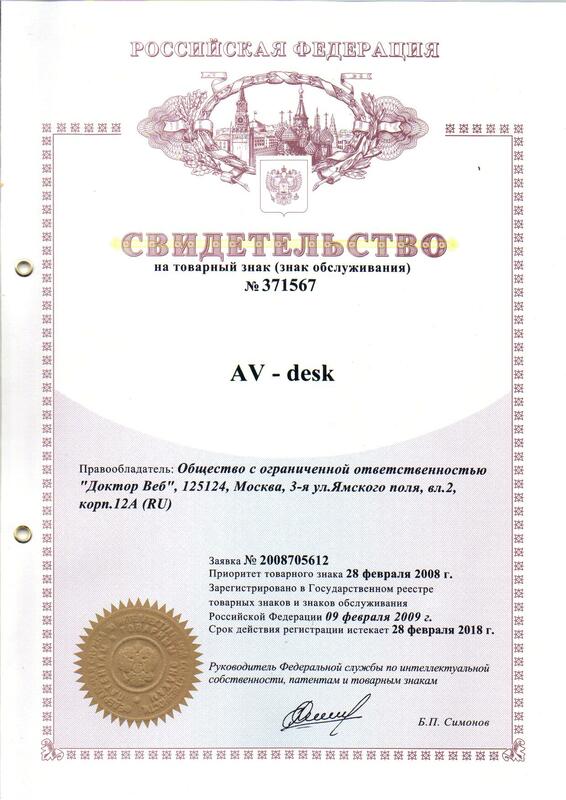 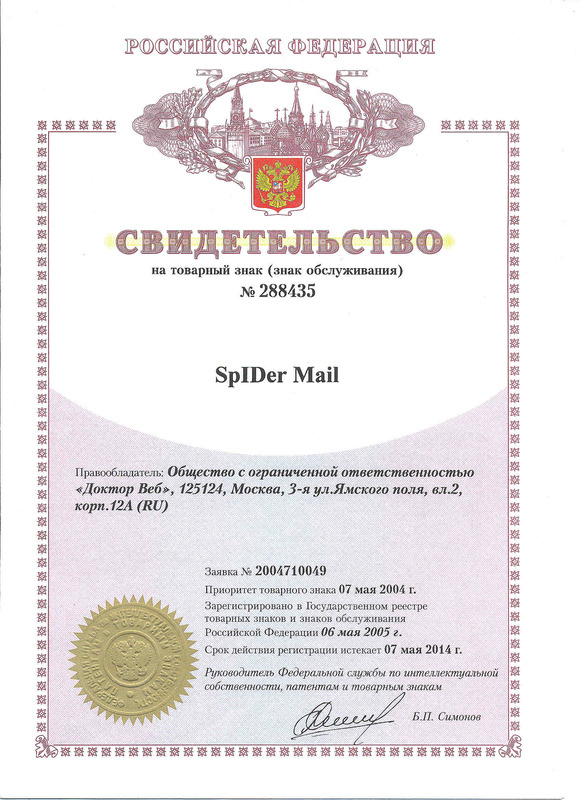 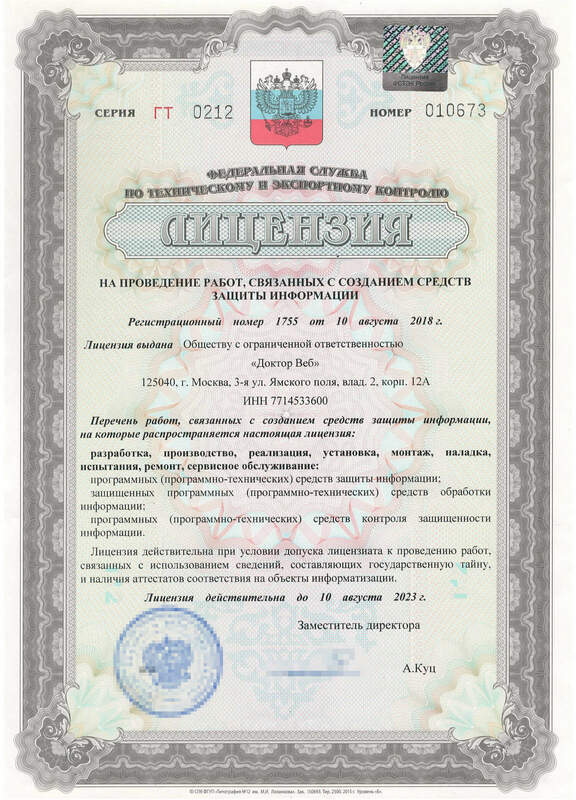 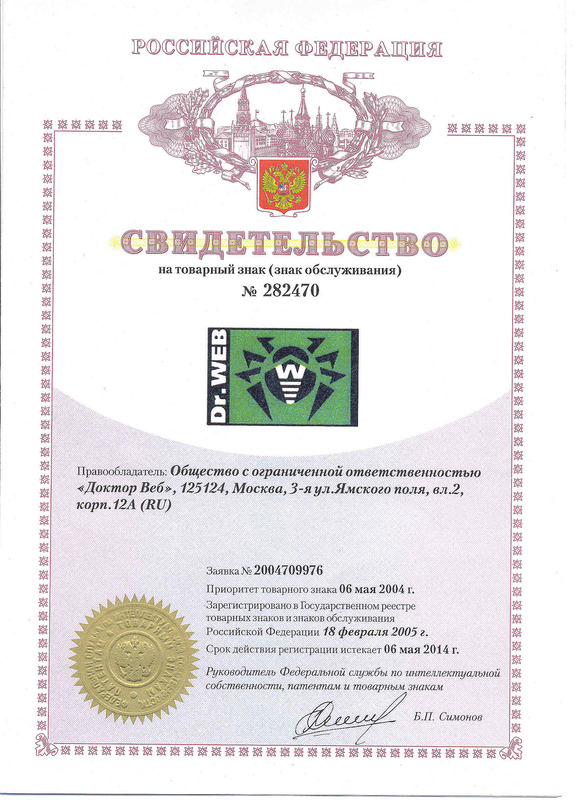 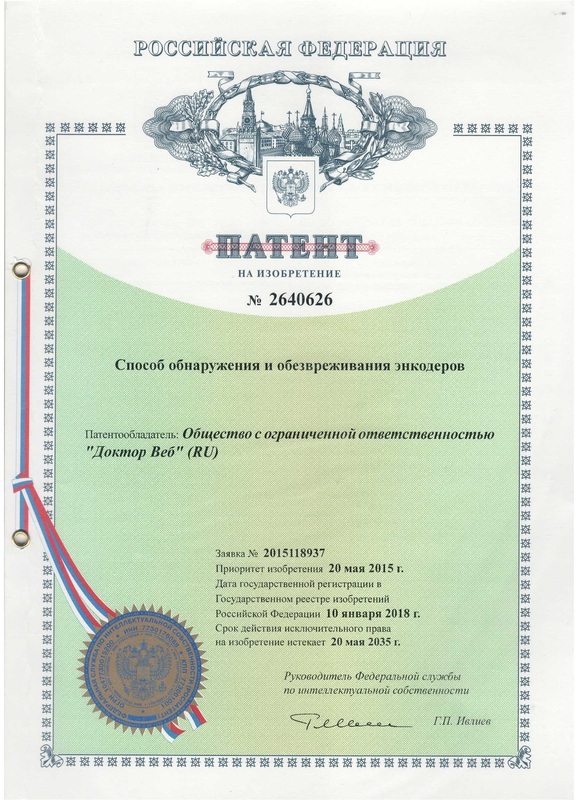 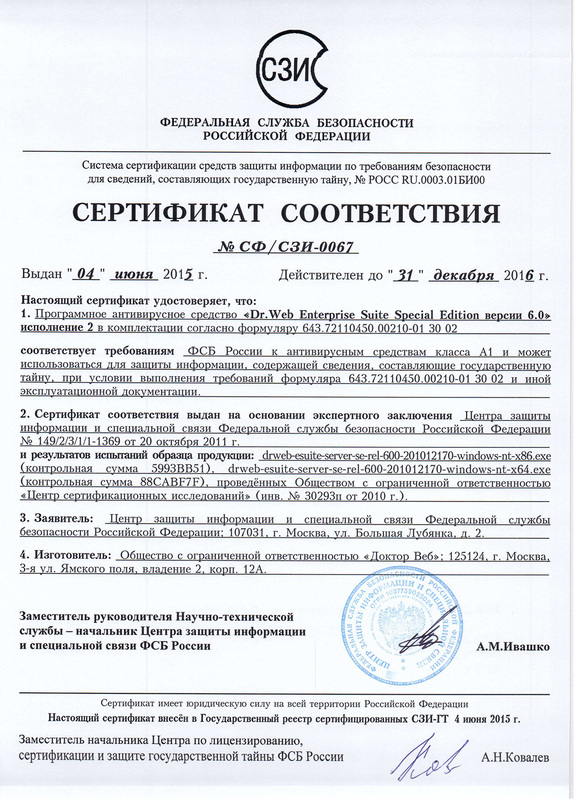 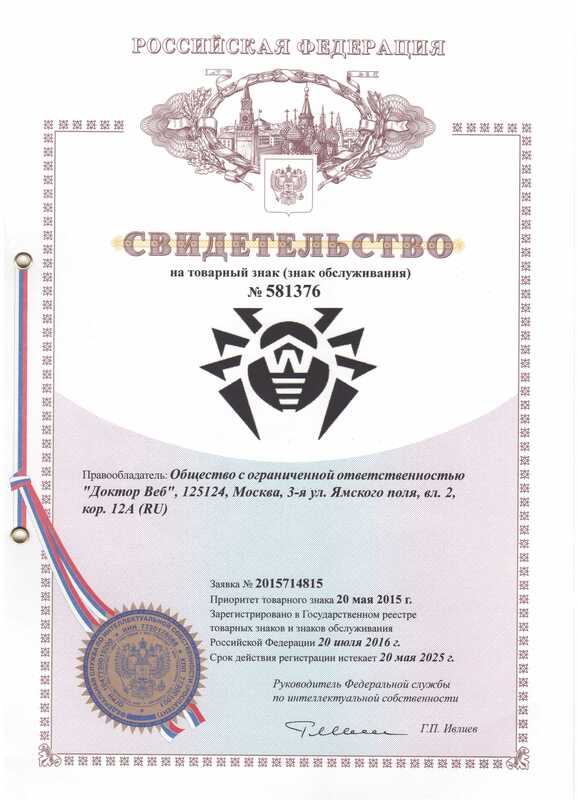 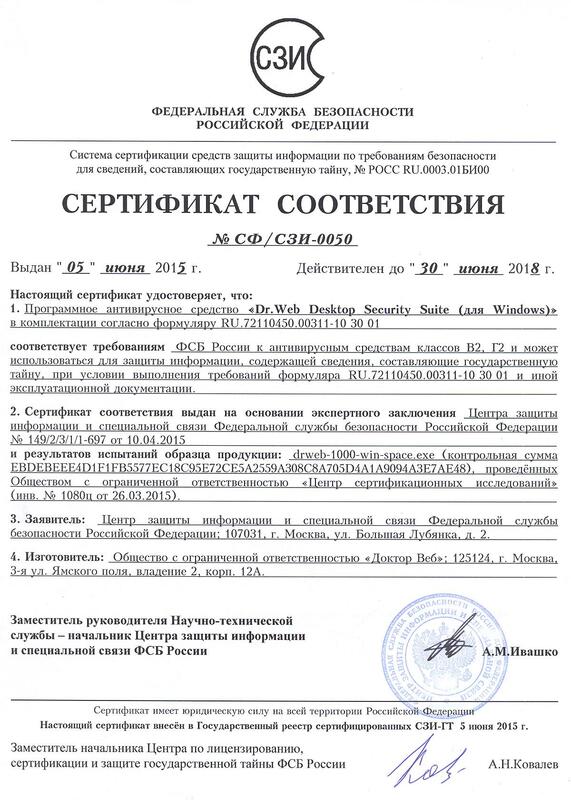 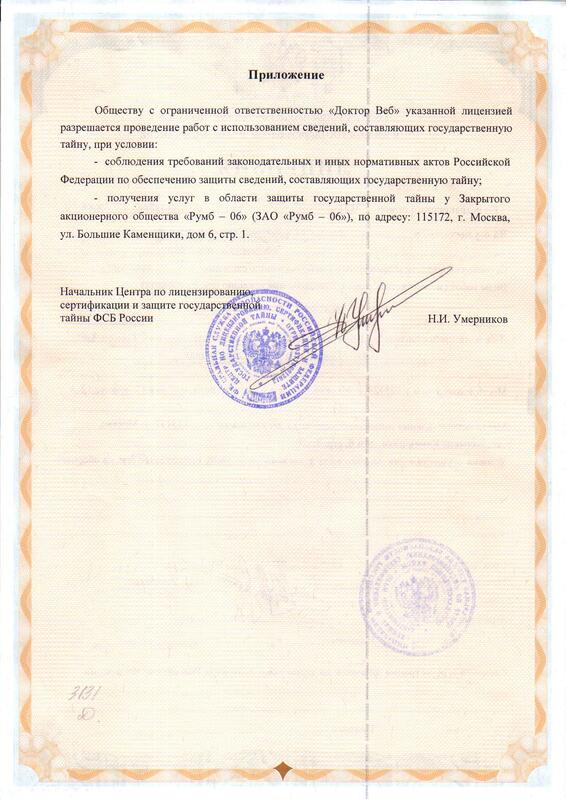 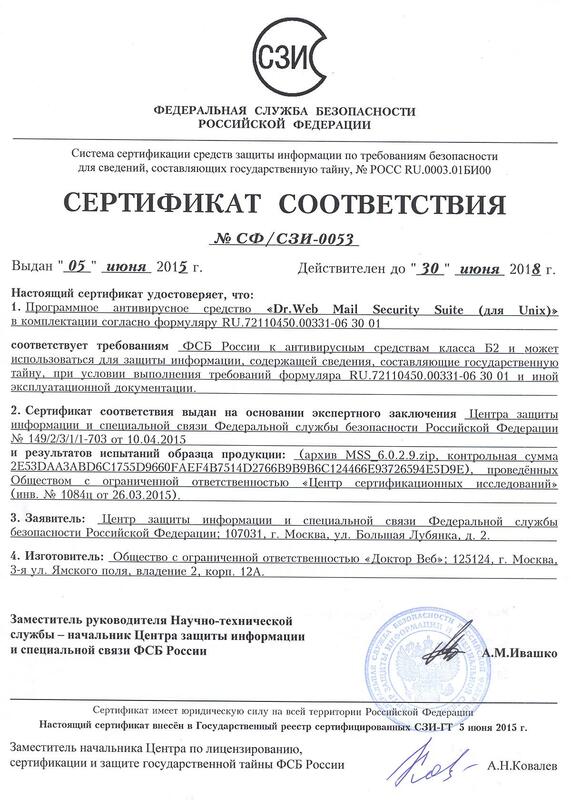 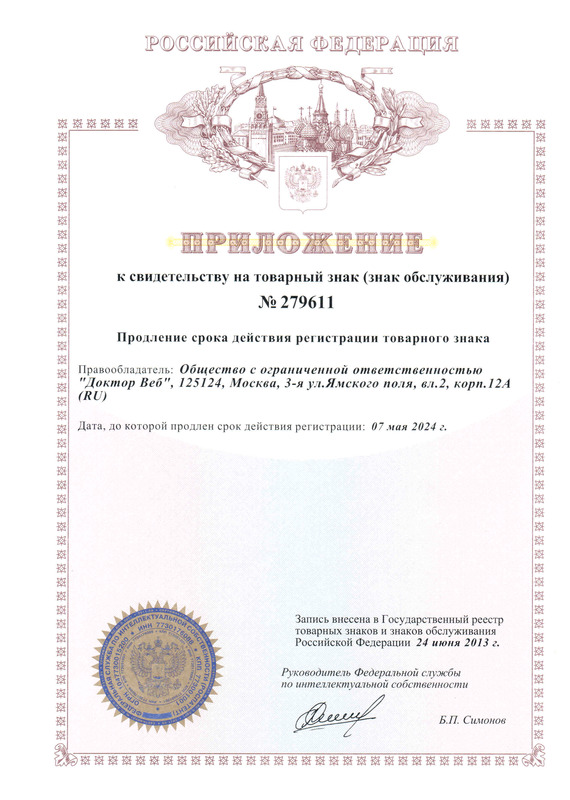 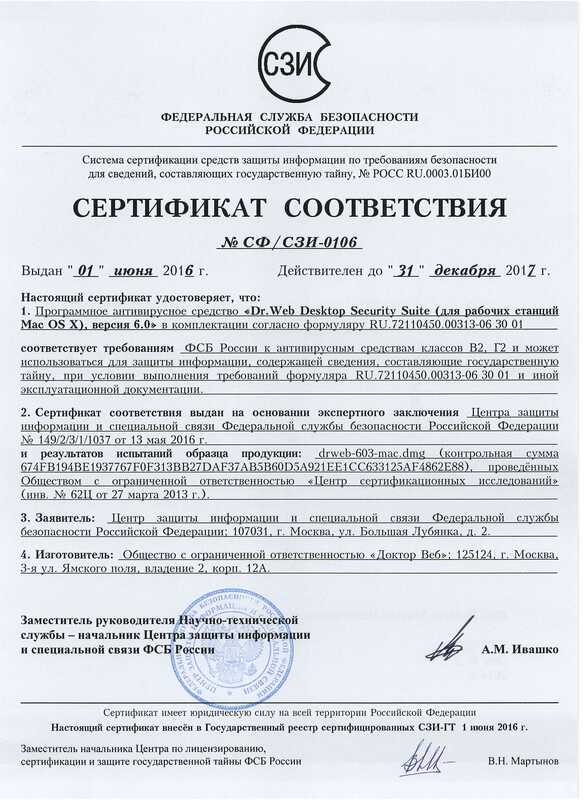 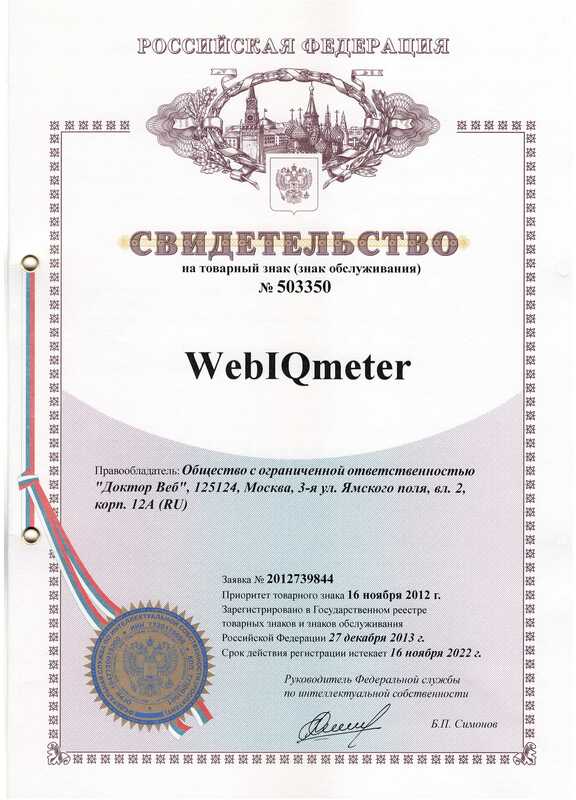 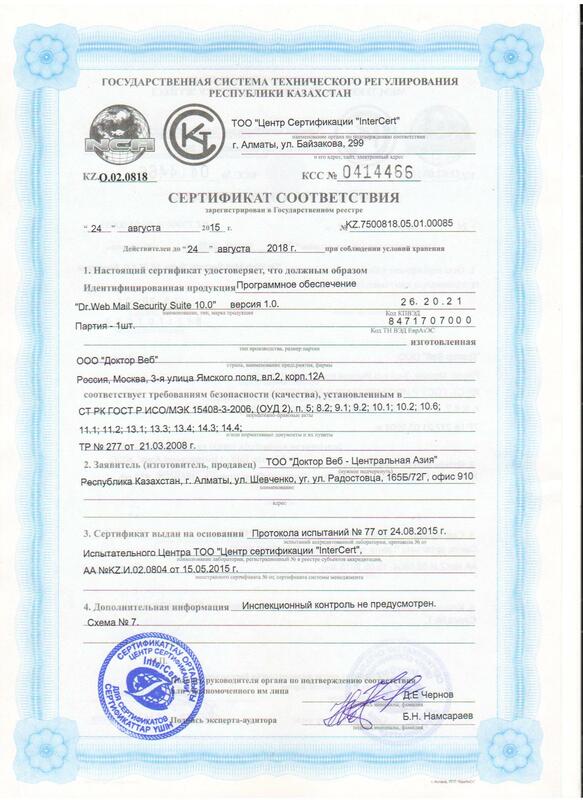 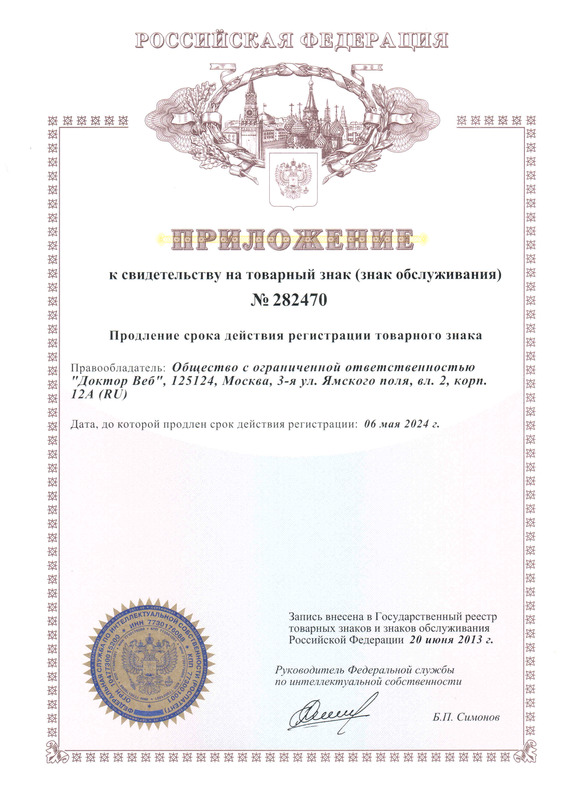 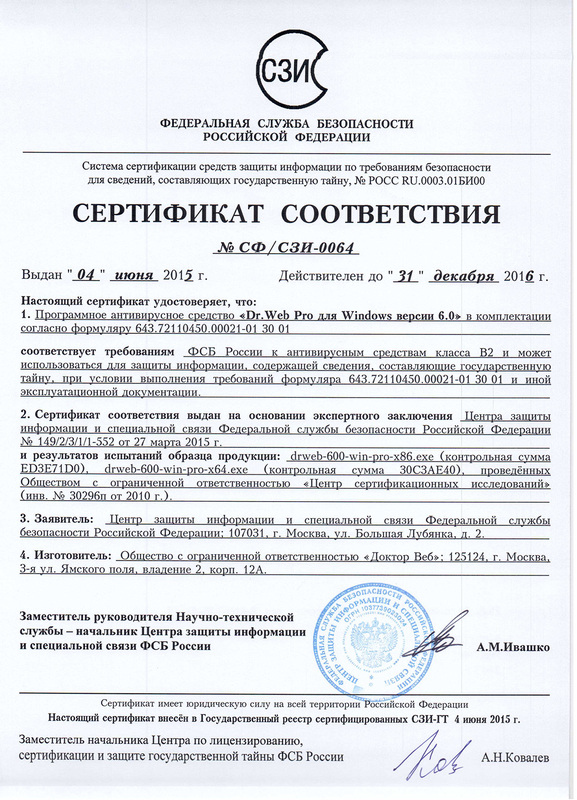 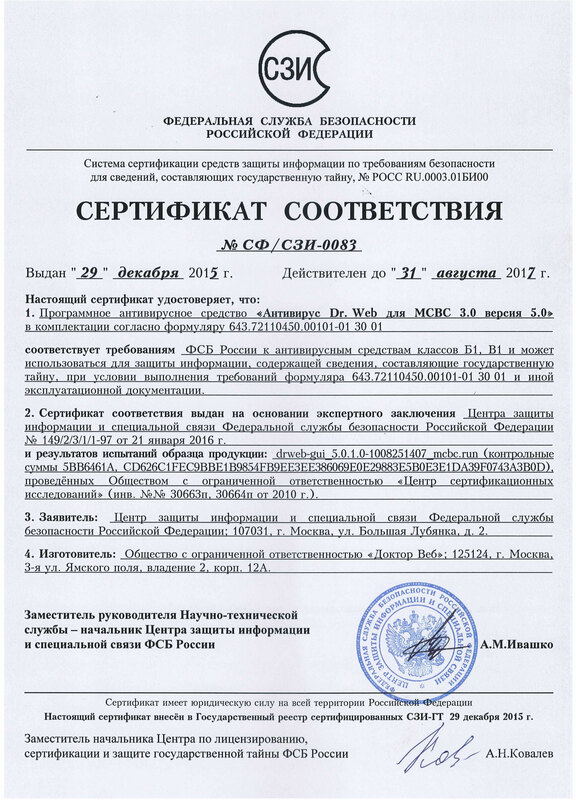 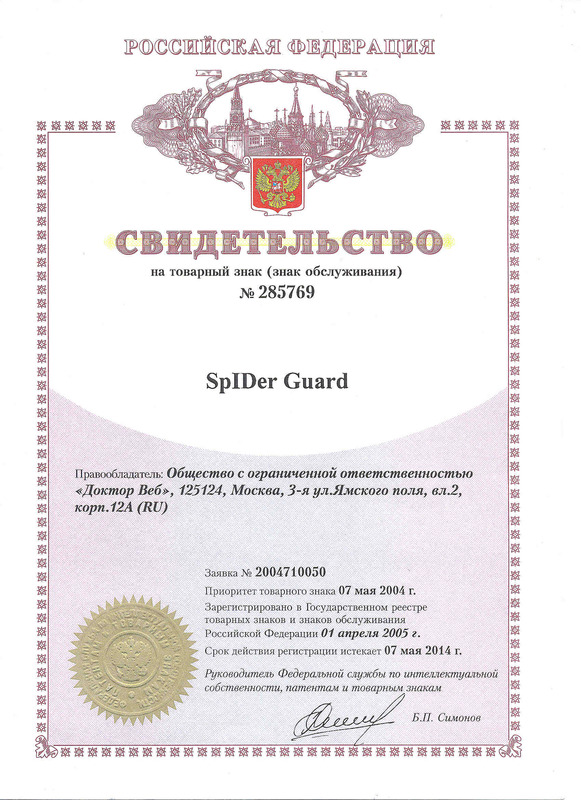 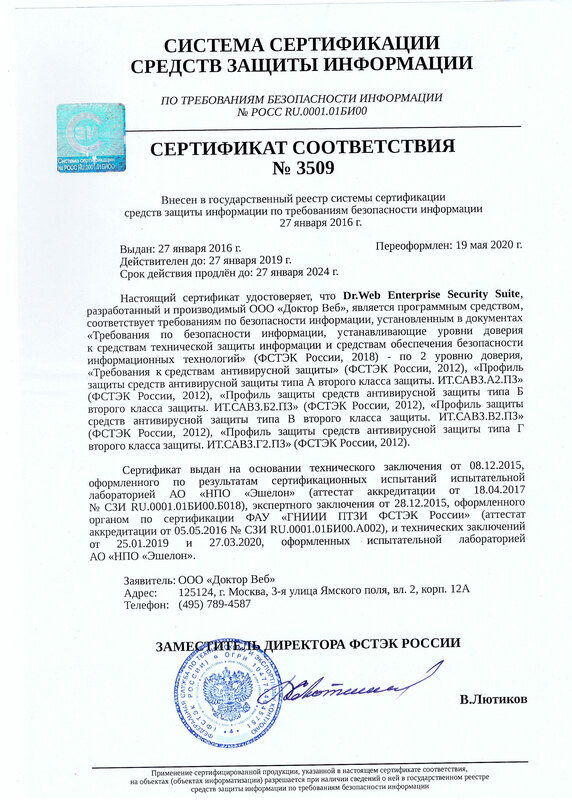 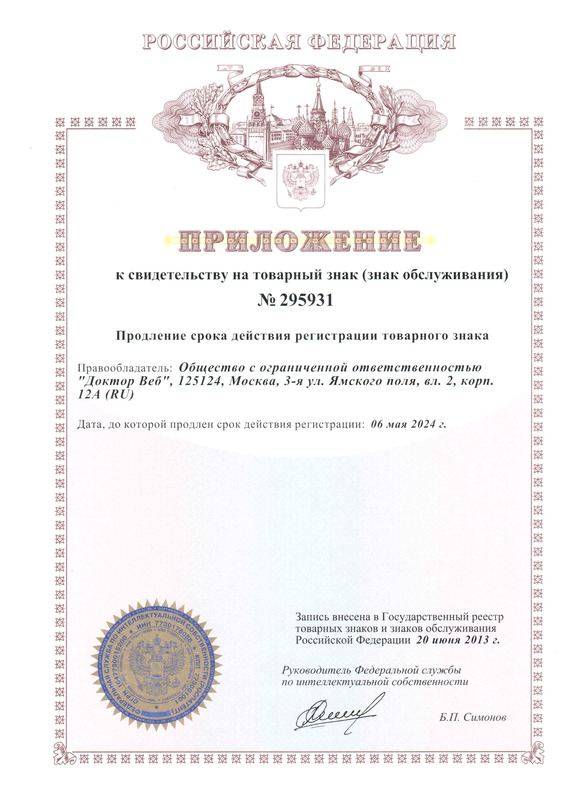 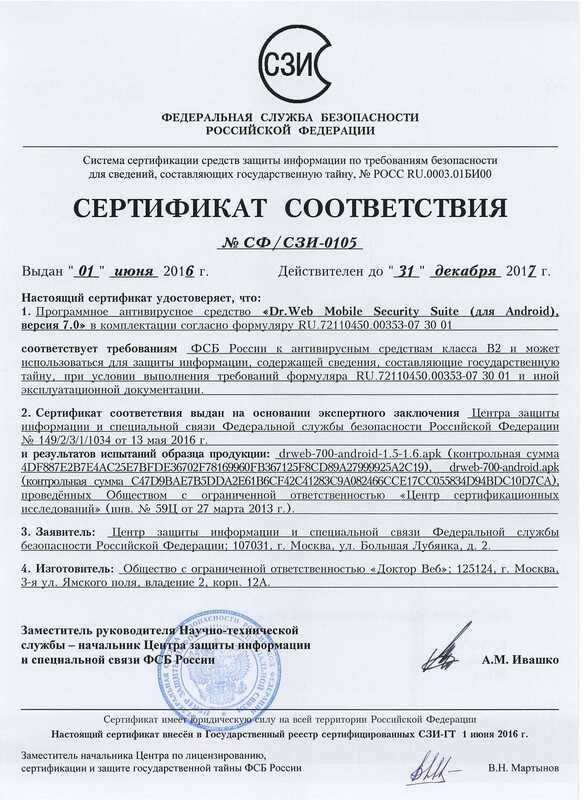 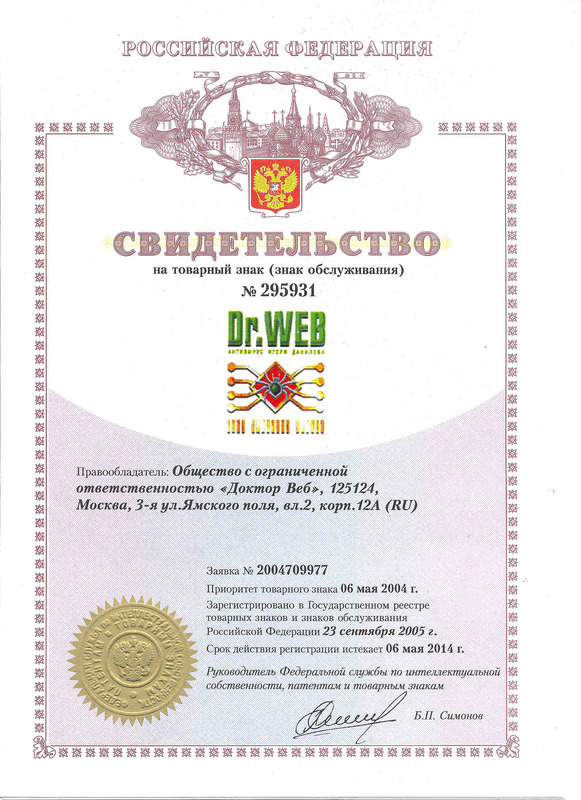 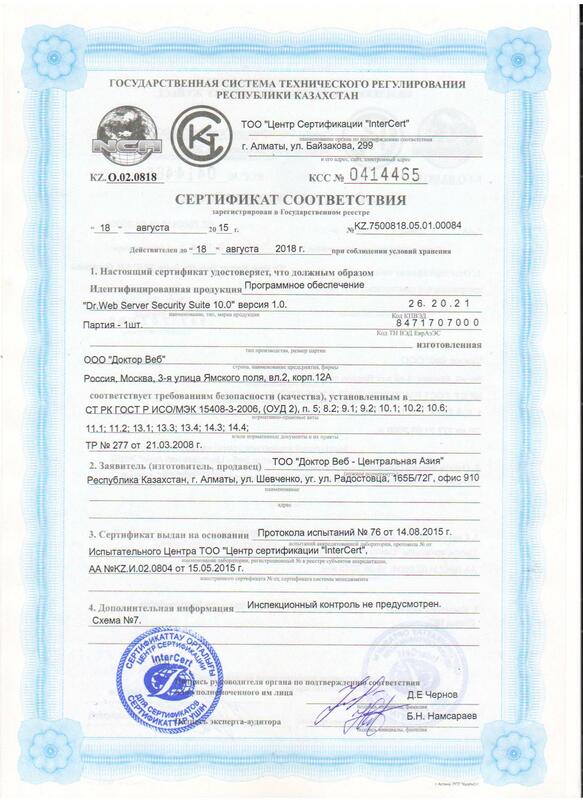 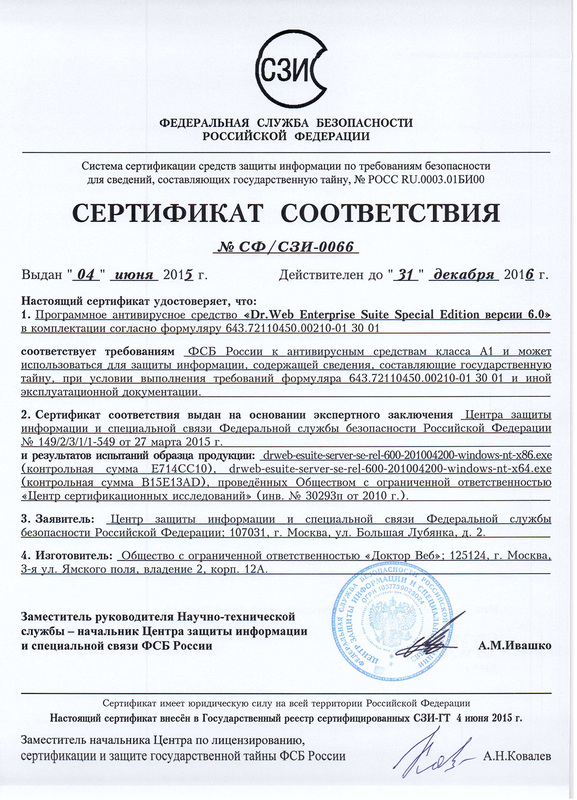 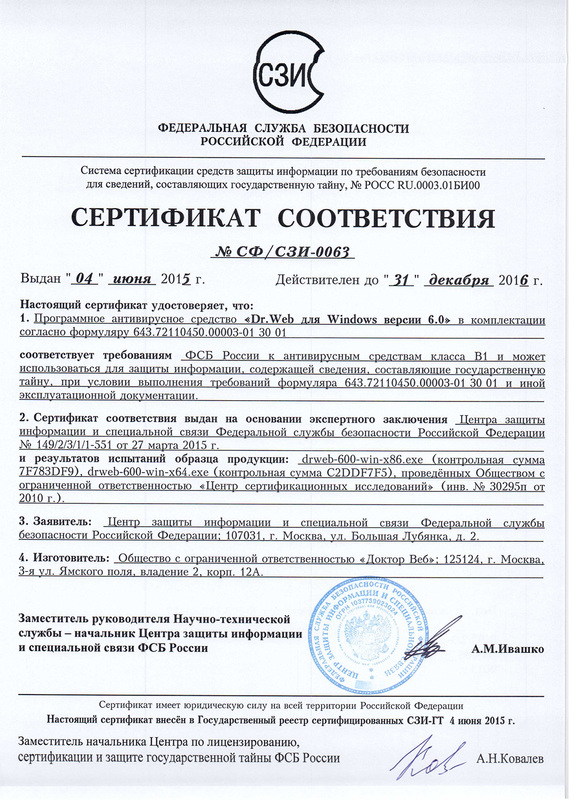 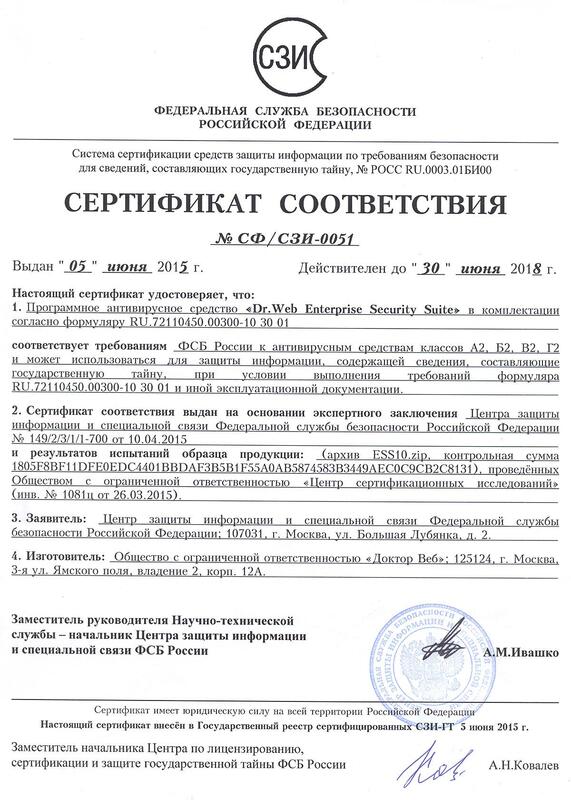 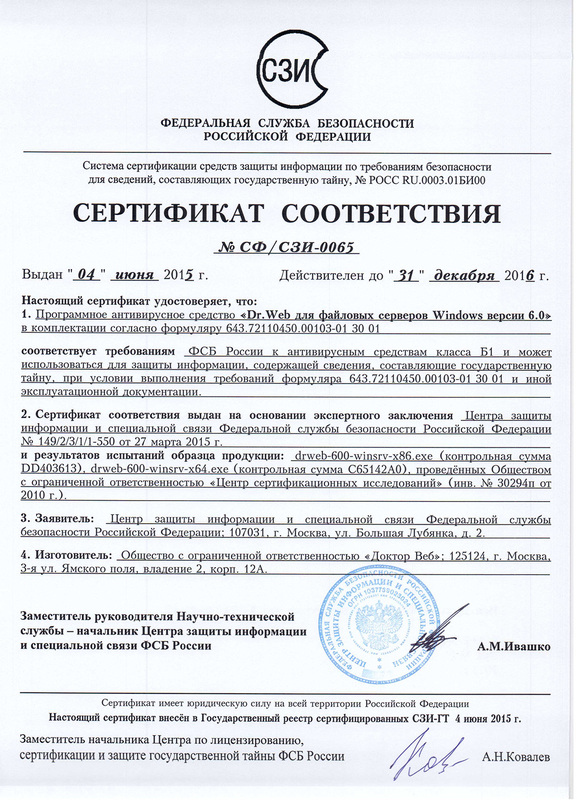 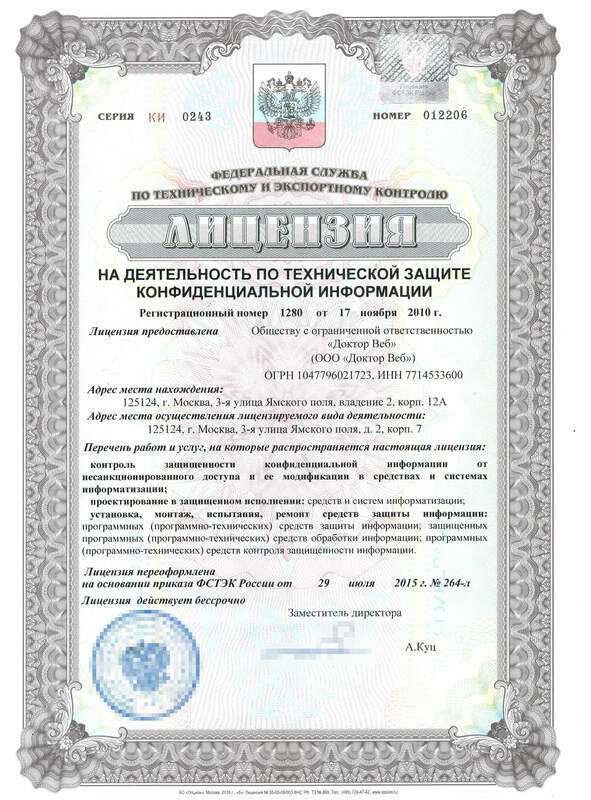 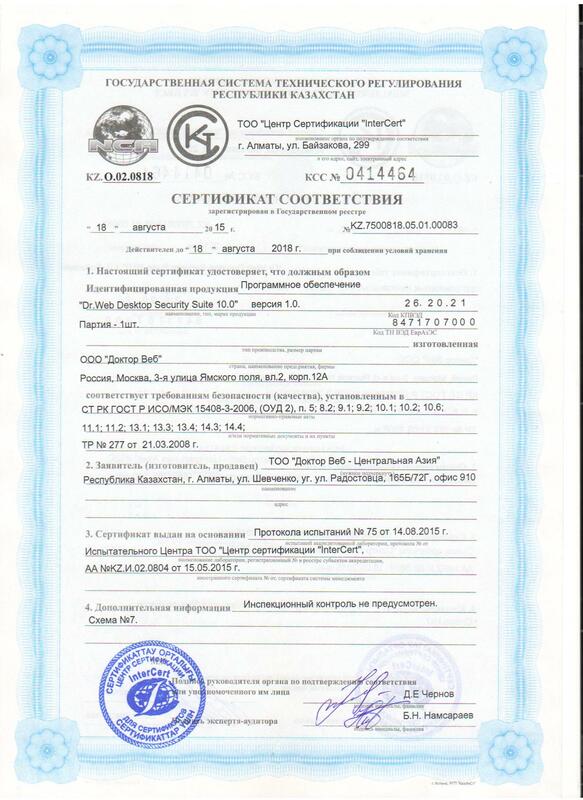 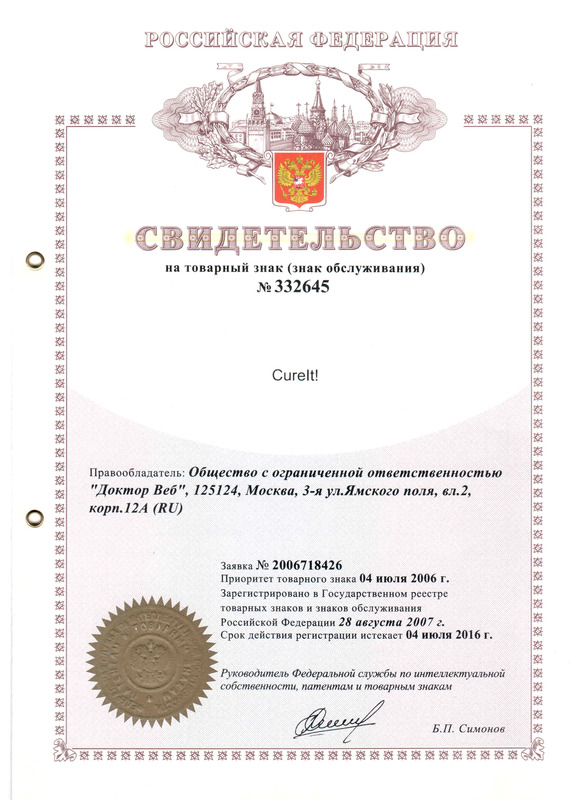 Unlike most of its competitors, Dr.Web software is certified by the Russian Federal Security Service (FSB). 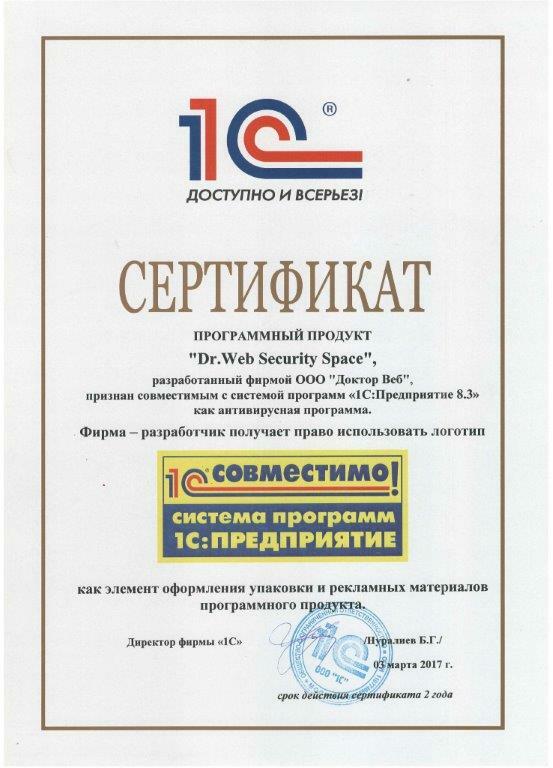 This means that it can be used by companies with high security standards. 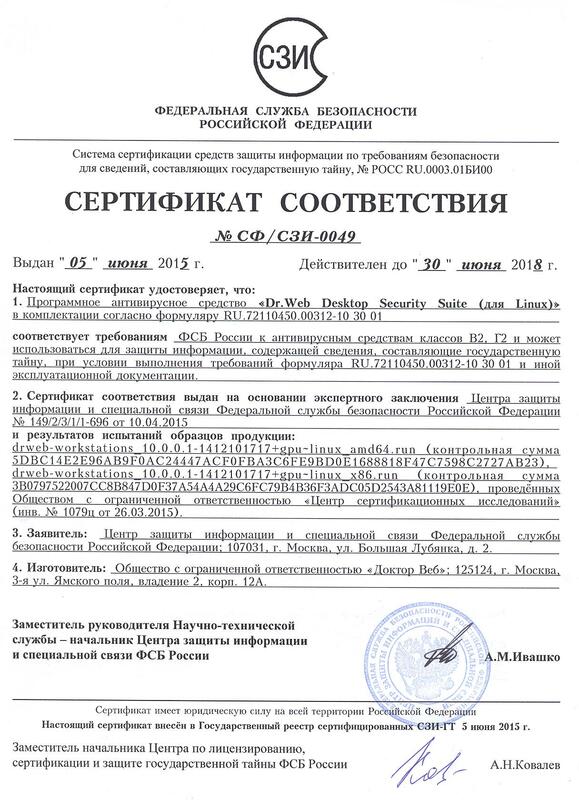 FSB Russia certificate of compliance for the anti-virus software "Dr.Web Desktop Security Suite (for Linux)"
FSB Russia certificate of compliance for the anti-virus software "Dr.Web Desktop Security Suite (for Windows)"
FSB Russia certificate of compliance for the anti-virus software "Dr.Web Enterprise Security Suite"
FSB Russia certificate of compliance for the anti-virus software "Dr.Web Gateway Security Suite (for Unix)"
FSB Russia certificate of compliance for the anti-virus software "Dr.Web Mail Security Suite (for Unix)"
FSB Russia certificate of compliance for the anti-virus software "Dr.Web Server Security Suite (for Unix)"
FSB Russia certificate of compliance for the anti-virus software "Dr.Web Server Security Suite (for Windows)"
FSB Russia certificate of compliance for the anti-virus software "Dr.Web Desktop Security Suite (for OS X workstations), version 6.0"
FSB Russia certificate of compliance for the anti-virus software "Dr.Web Server Security Suite (for OS X Server), version 6.0"
FSB Russia certificate of compliance for the anti-virus software "Dr.Web Mobile Security Suite (version for Android), version 7.0"
FSB Russia certificate of compliance for the anti-virus software "Dr.Web Anti-virus for МСВС 3.0 version 5.0"
FSB Russia certificate of compliance for the anti-virus software "Dr.Web Mail Security Suite (for MS Exchange)"
to provide information system personal data with up to security class I protection. 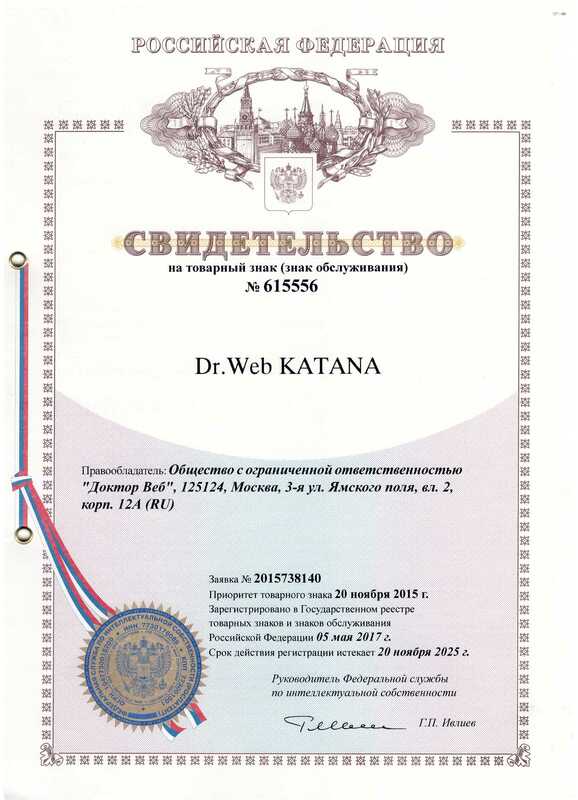 Unlike most of its competitors, Dr.Web software is certified by the Federal Service for Technical and Export Control (FSTEC) of Russia, the Russian Federal Security Service (FSB), and the Russian Ministry of Defence. 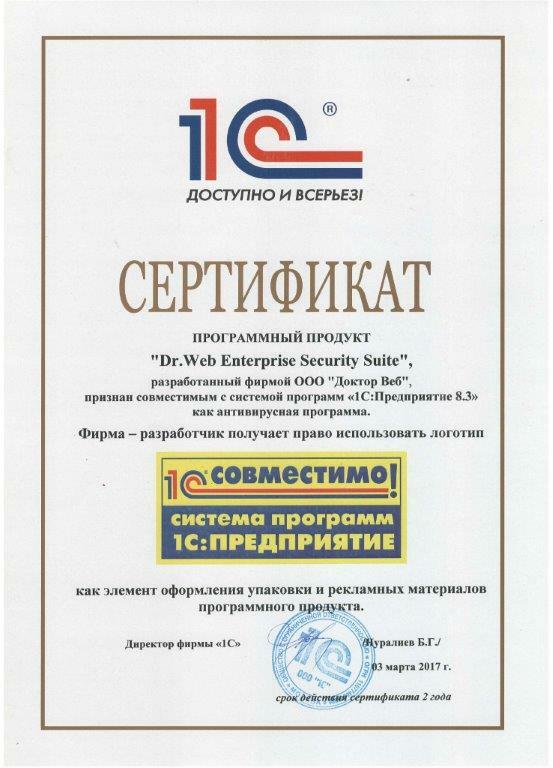 This means that it can be used by companies with high security standards. 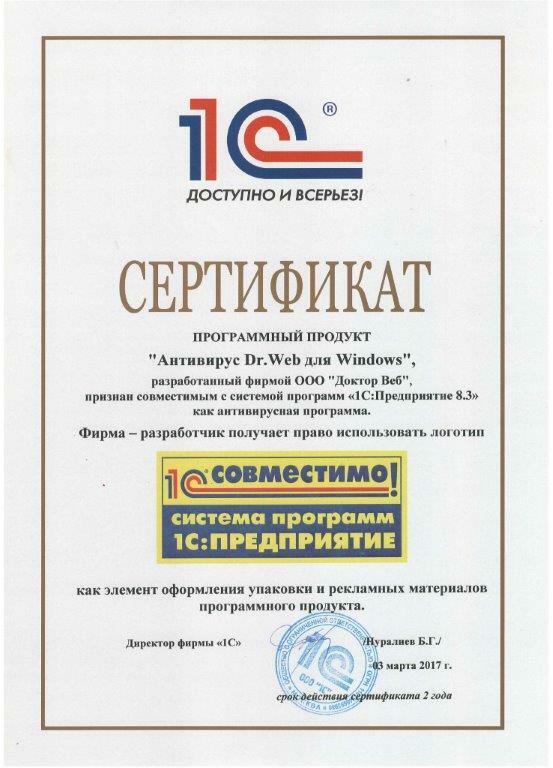 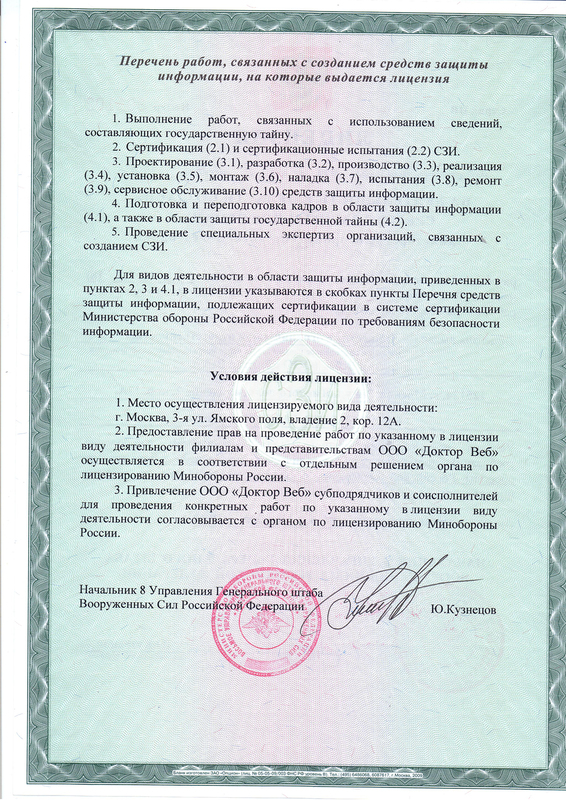 Certificate of compliance for the software product "Dr.Web Desktop Security Suite 10.0"
Certificate of compliance for the software product "Dr.Web Server Security Suite 10.0"
Certificate of compliance for the software product "Dr.Web Mail Security Suite 10.0"
Certificate of State Service for Special Communications and Information Security of Ukraine for "Dr. Web® Anti-virus for MS Exchange mail servers"
Certificate of State Service for Special Communications and Information Security of Ukraine for the software product "Dr.Web® Anti-virus for Unix gateways"
Patent №2624540 — "Method for detecting malicious programs archived using unknown computer algorithms"
Patent №2640626 — " Method for detecting and neutralising encoders"